I laughed a little when I typed the name above. Variation I. I wrote I because there is already a II in the works. I need this kind of work in my life to balance me. It makes me whole. This play on a traditional pattern that I would call an art quilt. Very traditional scraps spun into something that begged for stitching. Stitching that took on a life of its own. My fingers knew. My head did not. 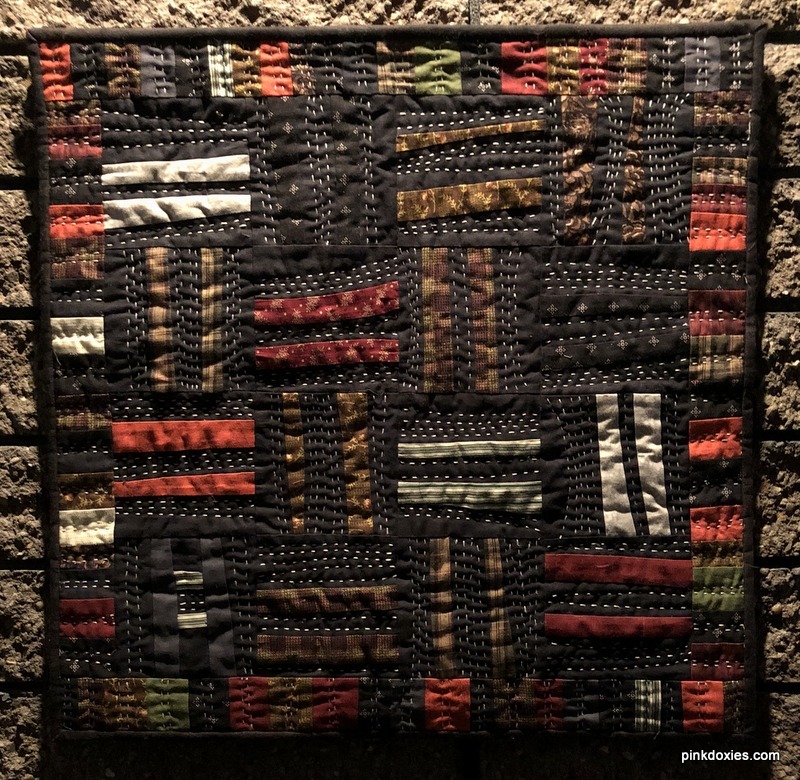 If you missed the two posts that dealt with the creation and progress of this small quilt, you will enjoy them. The top picture was taken in my kitchen flooded with winter light. The light dulled the colors, but the stitching stood out nicely. Hung in a dark hallway where it will hang to protect the colors, they are vivid. The down light over it misses some of the stitching. The rough block wall behind it minimizes the contrast, and allows it to blend in. It looks ragged and organic like it grew from the block, and I prefer this. It's done and hung, and I smile every time I walk by it. For a simpler design it is quite arresting I find, I think it's the lovely stitching, or maybe its the flashes of orange catching the eye, either way a great finish. I like the way the stitches bend, not necessarily with the piecing, it gives personality and confidence somehow, it makes a statement. What a switch from the pale vintage quilt! It has a African textile feel. What is not to love about big stitch? The whole combination pulls together but is not static. Great job! It has a very organic vibe going. I like how the stitching shows off in the dark browns. Congrats on a fun finish. Everything about this quilt is perfect! I love how the stitching enhances that Roman Strip pattern out of the ordinary. Outstanding. I love how the stitching enhances that Roman Strip out of the ordinary - outstanding. A fine finish. The stitching is what gives it character. The side lighting does give the quilt a depth and sparkle that the overhead missses. I'm just beginning to explore that effect. Having it make you smile every time you walk by is a special bonus! It's beautiful. From Sweden and Bambi thanks for your inspiration on the Show and Tell Monday !! Oh, my, it came out so nice! This is a beauty of a quilt, Julie! 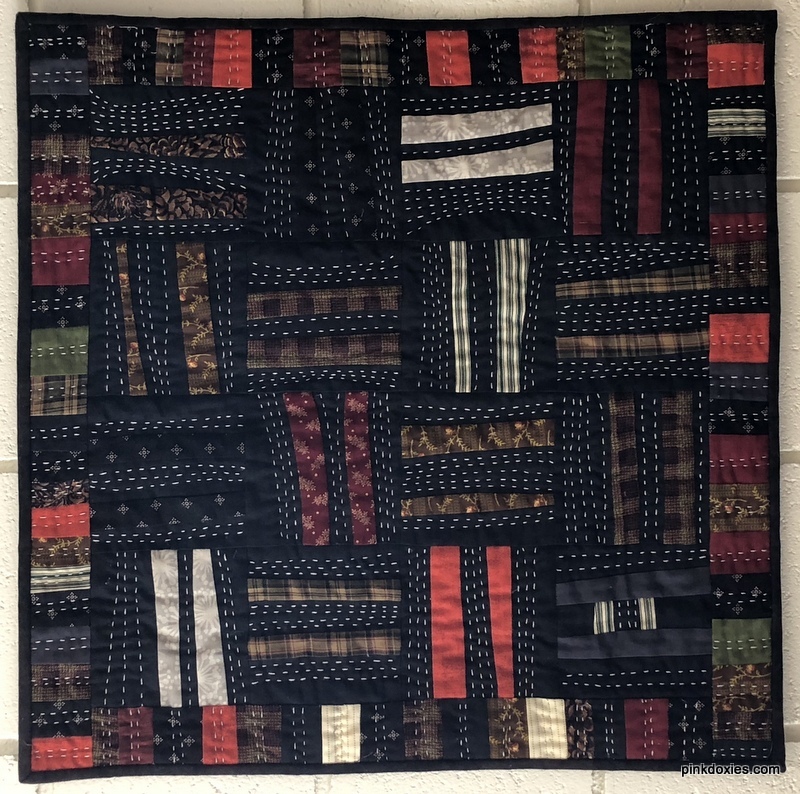 I'm not sure if it's the black "background" with the brown plaids, reds, and a few lights, or the light quilting thread, or the way it's quilted that draws me in -- or maybe it's all of them together. It's spectacular! I wish I'd made it. Oh, I love the stitching on this. It is quite dazzling. Not only smile, I think I would have to touch the texture of the wonderful quilting you added. Congrats on your finish and thanks for linking to TGIFF.